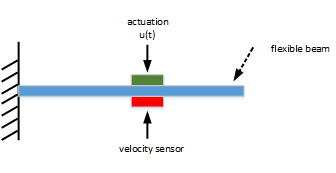 This example shows how to tune a controller for reducing vibrations in a flexible beam. with the following parameter values. 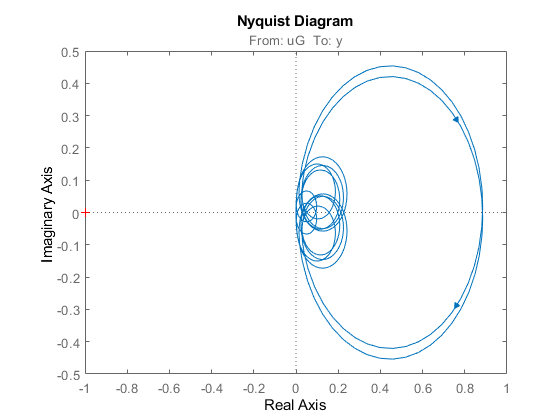 This is confirmed by observing that the Nyquist plot of is positive real. LQG control is a natural formulation for active vibration control. The LQG control setup is depicted in Figure 2. The signals and are the process and measurement noise, respectively. 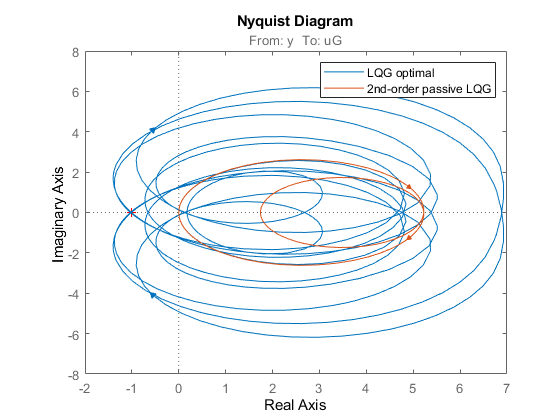 The LQG-optimal controller CLQG is complex with 12 states and several notching zeros. State-space model with 1 outputs, 1 inputs, and 12 states. Use the general-purpose tuner systune to try and simplify this controller. With systune, you are not limited to a full-order controller and can tune controllers of any order. Here for example, let's tune a 2nd-order state-space controller. Use the LQG criterion above as sole tuning goal. The LQG tuning goal lets you directly specify the performance weights and noise covariances. Now tune the controller C to minimize the LQG objective . The performance degradation is less than 5%, and we reduced the controller complexity from 12 to 2 states. 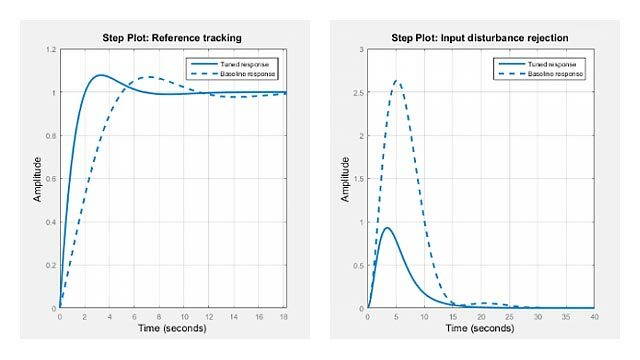 Further compare the impulse responses from to for the two controllers. The two responses are almost identical. You can therefore obtain near-optimal vibration attenuation with a simple second-order controller. We used an approximate model of the beam to design these two controllers. A priori, there is no guarantee that these controllers will perform well on the real beam. However, we know that the beam is a passive physical system and that the negative feedback interconnection of passive systems is always stable. So if is passive, we can be confident that the closed-loop system will be stable. The optimal LQG controller is not passive. 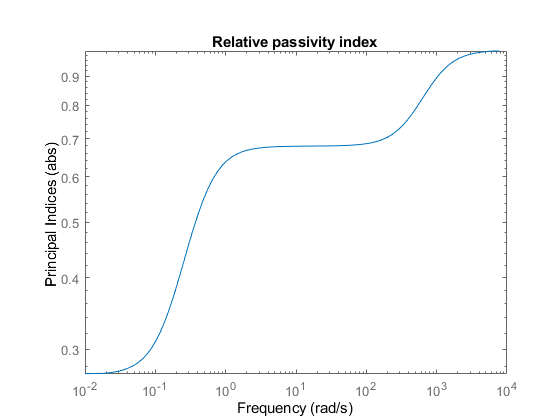 In fact, its relative passive index is infinite because is not even minimum phase. This is confirmed by its Nyquist plot. Using systune, you can re-tune the second-order controller with the additional requirement that should be passive. To do this, create a passivity tuning goal for the open-loop transfer function from yn to u (which is ). Use the "WeightedPassivity" goal to account for the minus sign. 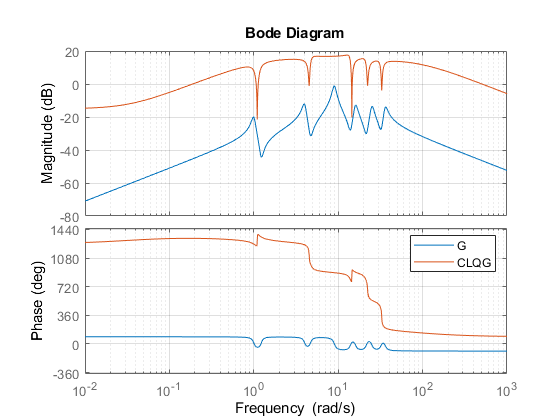 Now re-tune the closed-loop model CL1 to minimize the LQG objective subject to being passive. Note that the passivity goal R2 is now specified as a hard constraint. The tuner achieves the same value as previously, while enforcing passivity (hard constraint less than 1). Verify that is passive. 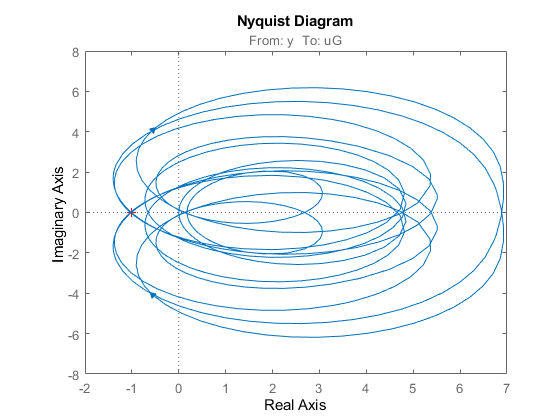 The improvement over the LQG-optimal controller is most visible in the Nyquist plot. Finally, compare the impulse responses from to . 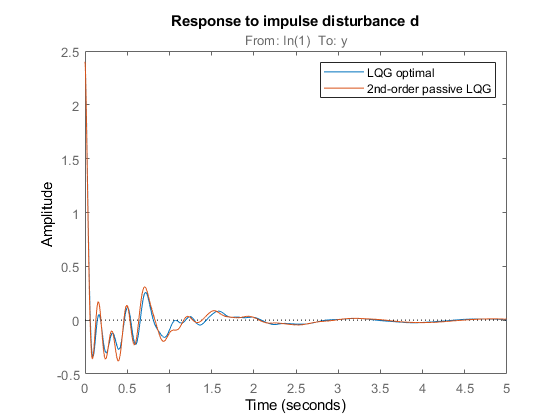 Using systune, you designed a second-order passive controller with near-optimal LQG performance.